Water treatment processes usually do a good job at eliminating bacteria, suspended solids, and some organic elements, thus, better safeguarding our health. Which are the most common minerals and oligo-elements in water? Which water is higher in minerals and which one should you be drinking? The human body relies on approximately 20 different minerals that contribute to its healthy functioning, however, not all these minerals are found in water, and more importantly, most of the beneficial minerals that are found in water are not in high enough concentrations to satisfy the Recommended Daily Intake (RDI). Calcium is important for the proper functioning of the nervous system, teeth and bone formation and blood coagulation. It’s found in almost any spring water or drinking water (that includes tap as well). An excess of magnesium and calcium in water is the cause of lime-scale deposits on kitchen appliances and bathroom sanitary equipment. Magnesium has an important role in many metabolic functions of the body and a recommended daily dose of 150 to 500 mg helps muscular and nervous activity. Albeit toxic in high concentrations, in small amounts (1.2 mg RDI) copper contributes to the health of your bones, and it’s used to treat copper deficiency. Copper may end up in your tap water in higher concentrations due to the corrosion of copper pipes. In very small amounts, chromium aids insulin transport glucose into cells and regulates blood sugar. In high amounts, chromium can cause a host of problems including stomach issues, damage kidneys, liver and nerves. In nature, sodium (Na) appears mostly in the form of salt (NaCl), which is why sodium deficiency is hardly ever a problem, since our modern diets are abundant in salt. Sodium regulates electrolyte balance in the body, and it’s an important element in muscular and nervous stimulation. Iron is another beneficial mineral that is used by the body in the production of red cells, being responsible for carrying oxygen in red blood cells. Children and female are most likely to suffer from iron deficiency, which causes fatigue, weakness, difficulty concentrating, all symptoms of anaemia. Selenium is toxic in high concentrations; however, small doses of selenium can help attack free radicals and preventing the aging process. High concentrations of iron and manganese in water can cause unpleasant tastes. Manganese aids the absorption of vitamins B and E and in the absorption of magnesium. It promotes the healthy functioning of the thyroid gland, improves metabolism, digestion, controls sugar levels, prevents osteoporosis, etc. Fluoride is another toxic substance that is believed to contribute to the health of bones and prevent dental caries if present in small amounts. However, in areas where water is high in fluoride or water is artificially fluoridated, careful monitoring of fluoride levels is highly important. Which water is better in terms of mineral content? Depending on bedrock origin and the treatment processes used to purify water, mineral contents that are present in your tap water or bottled water may or may not have a significant role in meeting the RDI of certain minerals. Generally, food, fruits and vegetables are a more significant source of minerals than tap water or bottled water alone. 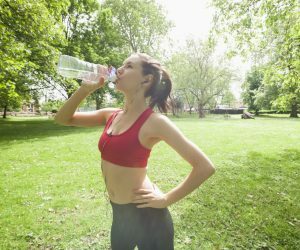 Individuals with marginal mineral intake from their food source may be the only ones to enjoy the greatest benefits from relying on water as their source of minerals. Depending on the filtration process that is used, filtered water may be lower in minerals than bottled water or tap water, especially if high-efficiency multi-stage water filters are used. For example, reverse osmosis is known to provide water that is devoid of minerals, thanks to its effectiveness in removing contaminants. Re-mineraliser filters are often used in these systems to re-introduce trace amounts of healthy minerals that were eliminated with filtration. Activated carbon filters and ceramic filters will usually not remove healthy minerals, but they also won’t remove other dangerous and harmful elements as efficiently as a reverse osmosis system will. Therefore, the health benefits of relying on filtered water, even if it doesn’t have as high a mineral content as tap water or bottled, are greater than the disadvantages of drinking water low in minerals. Water supplies also contain a lot of toxic minerals, which must be reduced or removed altogether. Water providers will monitor the presence of these and make efforts to significantly reduce their occurrence. Chlorination is the most widespread technique to produce microbiologically safe water. However, chlorine reacts with other substances in water and produces trihalomethanes, a chlorine by-product known to cause cancer. Chemical fertilisers and detergents are the most common causes for phosphates ending up in water supplies. Phosphates are linked to toxic levels of algae blooms in water that affects the health of aquatic flora and fauna. Levels below 10 mg/l are considered normal, however, higher levels can be dangerous for the human body since these substances have carcinogenic effects. Even low amounts of arsenic can be extremely toxic for the human body. Arsenic can cause a host of problems from cancer to neurological problems. Lead interferes with the normal functioning of the nervous system and haemoglobin formation. It’s particularly toxic for children, who can develop neurological and behavioural problems. Other contaminants that you may be exposed to by drinking water containing them include phyto-pharmaceuctics, surfactants, bacteria, viruses and parasites. Unfortunately, just like air pollution, water pollution has become an alarming issue. Safeguarding the cleanliness of our water by radically reducing water pollution, finding environmentally friendly methods of purifying water, and conserving water are important changes that we should all pay attention to now more than ever.